Placing Google Adsense Ads in Blogspot posts gives you a higher Click Through Rate (CTR) and also increases your income comprehensively due to the fact that the readers reads or views these ads more in the start when he is looking at the post of your blog. The best place you can place your ads and get a higher CTR is below the title of the post and right next to the content of the post. Either you can place the ad on the left, right or at the center of the post body. So in correspondence to that there are three different codes for each placement. First of all go to your blog's "Design" page and click "Edit HTML," on the opening page tick mark the "Expand Widget Templates" button. 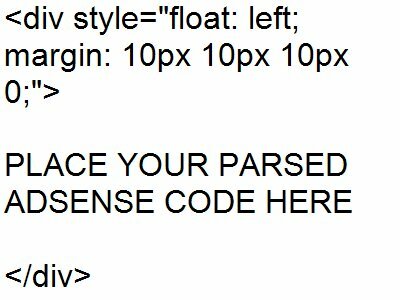 Replace "PLACE YOUR PARSED ADSENSE CODE HERE" with your Google Adsense parsed ad code. In order to parse your google adsense code, read "A website to directly parse your Google Adsense code" or "Parsing Google Adsense ad code manually". After placing your ad code simply save your template by clicking "Save Template". Your ads will be displayed on the left side of your blog posts in your posts. 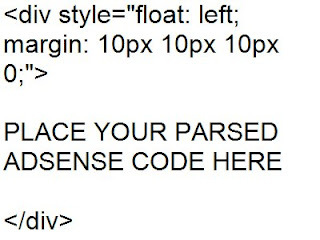 Replace "PLACE YOUR PARSED ADSENSE CODE HERE" with your Google Adsense parsed ad code. 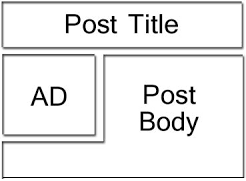 After saving your template, your ads will be displayed at the center of your post above the content and below the title of the post. I hope this article helps you, if you need more help Placing Google Adsense Ads in Blogspot posts just message on my facebook page. I will be writing more on these sorts of Articles and don't forget to follow my blog Ali Khan Blogs on facebook.